I really love these Jo! So many textures and nice layering. Very cool stuff! Love the rustic feel about this. I agree with Smiler, it would be a great magazine piece. I love the texture in the background and the limited palette! Nice job! Oh wow, love these! You definitely have to view these up close to truly appreciate their beauty. Great job! JO, these are wonderful! Greeneriffic. Overlapping images are so very nice to work with. Really shows depth. I like what you've done with the tags. Too kewl for school! absolutely gorgeous! i love these JO!!! I love the loose look of these. I like very much the way you did these. I like the light feeling to them. The "sketch" quality suits the theme, it keeps the veggies light and "crunchy". A more detailed, heavy drawing wouldn't have been the same. I like your illustration style (not boring or too, too, sweet...juste qu'il faut (just what's needed and not too much). Cool idea Jo. Great as always. 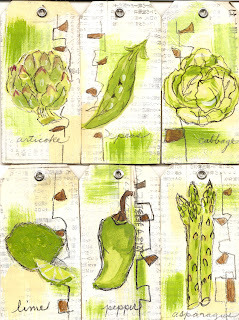 I like the light touch of the drawings on the tags, and I love the fresh shade of green. These say spring to me - they're really lovely! really beautiful! great colours and you feel like you could just put the tags in the garden next to the vegetable! great tags!and your leap illo is awesome...so funny! Very cool. I like your brush work, and those tags, what a great way to divide the background. I like the asian copy on the tags too, so different. In case you missed it, Artichoke is spelled wrong. these are really lovely Jo! make me want a garden! Wonderful vegetables from the Garden.